Relegation candidates Burnley took a shock lead against Manchester United this evening, Ashley Barnes fired the Clarets into the lead after a terrible mistake by Andreas Pereira. Manchester United midfielder Andreas Pereira has failed to make the most out of his rare chance for the Red Devils this evening, the Belgian-Brazilian ace made a calamitous error by trying to play his way out of trouble despite the fact that Burnley were pressing United’s defensive line. 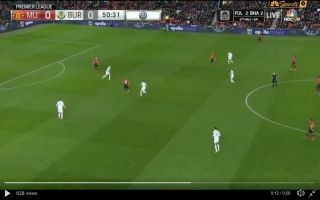 The ball was snatched from Pereira far too easily by Jack Cork, the midfielder then laid the ball off to Barnes and the forward smashed the ball into the roof of the net. There is nothing that David De Gea could have done to prevent the goal. United will be stunned by this result and it could give their upcoming opponents some confidence and more importantly it will be interesting to see how the Red Devils react to their first hardship under Solskjaer.